Community Services of Bangkok, or CSB as it is commonly known, was started in 1986 to try and serve the mental health needs of the ex-pat community. At that time no organization was offering professional counseling for foreigners in Bangkok, and most ex-pats were reticent to discuss sensitive issues with Thai physicians or therapists, preferring to do so with people from similar backgrounds and cultures. 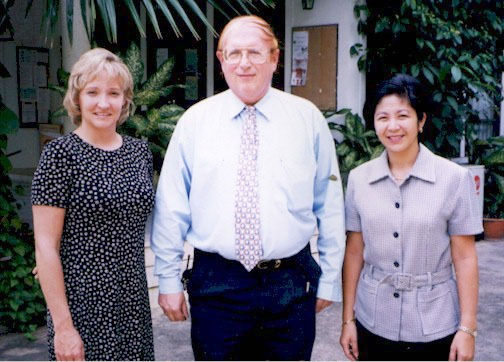 A driving force behind its organization was Dr Esther Roberts, the regional psychiatrist for the US Embassy, who arranged for a grant from the US State Department which allowed the CSB to rent their wonderful centre on Sukhumvit Soi 33. Initial support for the CSB came from the ex-pat community and from tfhe American, British, Australian, Canadian and Dutch embassies. Besides counseling, it was also set-up to provide educational and cultural programs for ex-pats as well. Nationality isn't important: the CSB can always provides services in English and Thai but in the past it has also offered services in German, French, Swedish, Danish and even Swahili. CSB membership costs Bt1,900 annually and this gets you a copy of the newsletter plus discounts on the programs the CSB offers. The professional counseling staff is paid staff members. The people who do counseling therapy are professional counselors and therapists who have all been schooled in western universities. CSB's counselors are drawn from a pool of applicants who just happen to be here, and who want to practice their profession while living in Thailand. Their spouse may be here on assignment, so it's a good way for them to keep busy. Four paid full-timers are on-hand: Ron Silvestro, the Executive Director; Margaret (Jake) Osselburn, in charge of business development; and two Thai assistants, Banch Welty who works in the front office, and Boonruen Nakachang, the bookkeeper. Ron says he tries to keep 8-10 counselors on staff, all on a part-time basis, and then a team of volunteers which round out the crew. The CSB is in a wonderful location. Tucked in off a small soi about halfway down Sukhumvit Soi 33, the setting is very serene. Being off-road, it also offers people the privacy and confidentiality that many are looking for when seeking counseling. Ron also says, "It's better that people seeking help come here because they are away from their worksite or the cause of their stress." As for counseling itself, Ron says, "When someone calls in looking for help, we determine whether he or she want a male or female counselor and what their time preference is. We try to match our member's needs with our availability, and we can do that from 8 in the morning till 7 in the evening from Monday to Saturday." Normally full-payment is expected (Bt2,900 an hour) but Ron does say the CSB never turns away anyone who is in crisis, and when someone is in serious trouble but can't afford to pay the full fee, a sliding scale kicks in which is based on availability at that point of need. "What we are seeing is an increasing number of people that I call the `other ex-pat' who don't have a high income or pension and need to seek counseling for a variety of reasons. We want to help these people but we need more funding in order to do so," Ron says. The CSB also has Employee Assistance Programs where corporate members such as Unocal, Esso, Kimberly Clark, Effam and Dow Chemical have signed up to offer CSB courses like orientation to Thailand and repatriation to their employees. The CSB also holds meetings for Alcoholics Anonymous, Narcotics Anonymous and Overeaters Anonymous. CSB's programs cover a wide range of topics including: conversational Thai, introductory Buddhism, candle carving, massage therapy, watercolors, stress proofing your marriage, coping with family flight, first aid & CPR, nutritional English cooking for maids, tae kwon do and scuba diving. This is really a wonderful organization: it saves and betters lives and deserves our full support. Ed Note: The CSB and Roger Welty have published a wonderful book called The Thai and I. It's an absolute must read for anyone spending any length of time here. It costs Bt700 in the bookstores, but members can get it for Bt500. What is Community Services of Bangkok? Community Services of Bangkok (CSB) is a non-profit making members association, providing mental health and welfare services. The aim of their services is to help people improve their general well being and maintain a positive approach to their lives, while they are in Thailand. Since it first opened its doors in 1986, it has gathered information about services, which are available both locally and in neighboring countries. It can help to solve most practical problems and provide support for emotional issues. CSB has a team of Western-trained counselors and psychologists. The counselors are a mix of Western and Asian, male and female and are able to counsel in a number of languages, including Thai. All their counselors are experienced professionals and counseling sessions are confidential. Counseling is paid for on an hourly basis at the time of the appointment. A reduced fee is available for clients with limited incomes. Appointment should be made in advance by telephoning CSB. CSB's counselors can also facilitate a wide-range of mental health workshops designed specifically to meet each organization's criteria. Businesses, schools and clubs are encouraged to contact CSB's Counseling Director for further information. CSB can provide a range of individual and group seminars, tailored to the special needs of each client. Its consultants are experienced expatriates who have found overseas assignments successful and fulfilling. It can also help those who have recently arrived in Thailand. Its goal is to smooth the transition from a familiar environment to a foreign country and lay a positive foundation for a happy and rewarding life here. It runs a broad range of courses, outings and cross-cultural activities. Its members come from all over the world and welcome the opportunity to meet new friends. Every month there is an opportunity to get together over coffee and just chat! Volunteers are able to contribute their valuable skills by assisting in the running of CSB. This could be by welcoming visitors, assisting with marketing and public relations activities, joining fundraising events or training to become part of the Helpline team. Community Services of Bangkok provides organizations with employee assistance through developing a complete package of services, which can be delivered either at CSB or the company work site. Counseling/therapy normally occurs in a face-to-face setting with you, your family or other person depending on the situation. An individual may seek counseling for a number of reasons ranging from having a difficult time adjusting to Thailand to marital discord to depression and for a variety of situations ranging from not so serious to very serious. The counselor assists you in recognizing what is the root cause of your situation and how to cope and provide yourself with relief. Sometimes one session is sufficient, however, in some cases, longer term counseling is required. One must be aware that issues build up over a period of time and may not necessarily be eliminated quickly. When you come to see a professional counselor at CSB, your confidentiality is foremost in our mind. No one can obtain any information about you unless you sign a release and only your counselor has access to your particular case. How Well Trained are the Counseling Staff? All counselors/therapists working at CSB are trained as counseling therapists at the Master's Degree Level or higher. Everyone, including their Thai professional staff, have been educated and trained abroad. In addition, all have experience working in a variety of settings with a diverse group of clients. Is There Anything that CSB's Counselors Cannot Handle? The counseling staff when presented with a situation that requires medication, physiological evaluation or hospitalization coordinates with psychiatrists at leading Bangkok hospitals. An appointment can be made by calling directly into CSB's general telephone number 258-5652/258-4998 and requesting information on counseling/therapy. The counseling administrator will obtain some very basic information, explain the procedure and costs, and make an appointment around your schedule. Appointments are normally scheduled from Monday through Saturday from 9:00 AM to 6:00 PM depending on what counselor/therapist you are working with. One can also make an appointment by fax at 260-3563 or by email at csb@loxinfo.co.th. Please leave a name and phone contact. It is with regret that we must close the doors of Community Services of Bangkok. After much consideration and effort by the CSB Board, counseling staff and volunteers we have determined that CSB is unable to sustain our present operation. The financial crisis has continued unabated, our operating costs continue to out weight our fund raising efforts. We have no other option than to cease operation. CSB was founded at a time when there were no counseling resources for the expatriate community and a majority of the foreign population was localized in the Sukhumvit area. For 16 years CSB has been there for the community as both a resource center and a counseling center. Many of CSB�s revenue generating programs, (relocations, employee assistance programs, and cross-cultural orientations) have been adopted by local businesses. There are several new counseling centers opening up and many of the women�s clubs offer similar activities to programs offered at CSB. We want to sincerely thank our many friends in the community for their ongoing support.